This season opened with Dexter saying good-bye to one woman in his life and ended with him saying good-bye to another. If you saw the whole Lumen-breaks-Dexter’s-heart thing coming, you were ahead of me. I didn’t anticipate it. And it stung. How dare she! But she did. And it felt right. Even if it hurt. The finale upheld the twin elements that make Dexter enduringly engaging, five seasons into its run: its celebration of the fun part of TV — the willful suspense, the tricky plot twists, the larger-than-life characters — and its enduring capacity to make the life of a uniquely scarred murderer feel transcendentally human. The writers got everything right about the Lumen-Dexter split. The look on Dexter’s face when Lumen initiated “the talk” is a perfect encapsulation of the sucker punch that is an unforeseen breakup. You know how the conversation you have when you split can weirdly become the most intimate and romantic moment in your entire relationship history? That’s here, too, when Dexter tells Lumen not to be sorry, that he’s glad her dark passenger has gone and he will carry her darkness with him forever. And the emotional backtracking we all do once someone has hurt us was also present, with Dexter saying he and Lumen aren’t the same and that it was ridiculous of him to hope otherwise. Against all his instincts, against everything he knows and trusts and understands about himself, Dexter went out and tried to love. He took a risk. And it succeeded beyond his wildest expectations. And then it failed. He was rejected by the one person who really saw him for being exactly who he is. It’s absurd that Dexter would interpret all of this as proof of his lack of humanity (“While she was here she made me think for the briefest moment that I might even have a chance to be human,” he said), because in many ways he’s never seemed more like the rest of us: vulnerable, hurt, and messy. The episode opened with Harry warning Dexter that chasing after his nemesis to protect the girl he loves never ends well. But Dexter was crazed. He felt like he understood Jordan. “He’s like me,” Dexter said. “He needs his routine.” Dexter was sure Jordan had taken Lumen back to the place where they initially raped and tortured her. And he was sure he could figure out where that is if he could just get to the office and get a look at Chase’s property records. But then the other side of his life intervened. He opened the front door to his house, knife-carrying case under his arm, and there was his entire family — Astor, Cody, the grandparents, the nanny, and Harrison — all in bright colors with big grins on their faces. They’d come to surprise Dexter by celebrating Harrison’s birthday at home! Dexter managed an only mildly socially awkward escape and headed to the office, where Deb was trying to track Jordan Chase and Quinn was trying to determine exactly how pissed off Deb was at him. “Can’t assume anything right now,” Deb replied. Back at the station, Dexter sneaked Chase’s property records off Deb’s desk, and was going through them, wracking his brain for exactly the kind of spot that would make a good hideaway, when Harry reappeared. “It’s right in front of you,” he said as Dexter leaned over the paperwork. (This part totally reminded me of the weird mentor-mentee relationship between Lecter and Starling in Silence of the Lambs.) “Jordan wasn’t always Jordan Chase.” Duh! Dexter called the property clerk and requested info on any holdings under the name of Eugene Greer. The guy was a total pencil pusher, and Dexter really leaned into him, seething that this wasn’t a request for someone who’s late with a permit, a woman’s life was at stake. It was one of those moments, again, where Dexter seems profoundly human. His love for Lumen brought him to life. Dexter was in the midst of all of this when LaGuerta announces the team had a new crime scene. Someone found Liddy, dead in his van. Quinn looked ashen. The fastest way to the crime scene was apparently by boat, and en route Quinn was madly deleting his voice mails from Liddy. Good detective work! Dexter, meanwhile, delivered one of the best, deadpan lines of the season: “Jordan’s had Lumen for twelve hours and each second I’m stuck on this slow boat going to my own crime scene takes her farther away from me.” They get to the van, Dexter and Masuka were working their magic, and then the team found Liddy’s phone, which was full of nothing but calls to Quinn. LaGuerta confronted him. After she saw the drop of blood in his shoe and asked him about it, he clammed up and requested a lawyer. Quinn looked guilty, and we all knew the blood was going to turn out to be Liddy’s. Dexter got the call he’d been waiting for: Eugene Greer owned the “River Jordan camp for boys and girls,” which has been abandoned for decades. “A camp,” Dexter mused. “Jordan took Lumen back to where it all started, with Emily.” He stole a really ugly red car and zoomed off in search of his woman. Harry was beside him again, warning him that Chase was goading him, that he’d be waiting for him. “You need to stay alert, to pay attention,” Harry said. 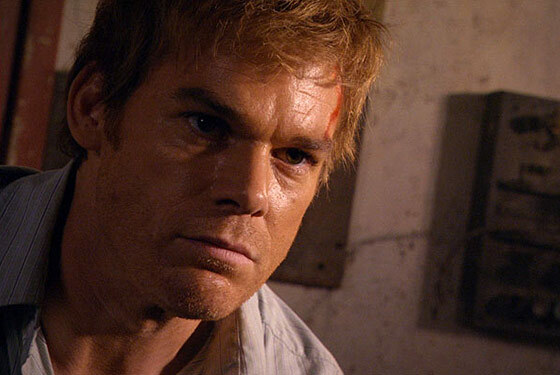 “Don’t underestimate your adversary.” Just as Dexter was shouting at his father to trust him, for once, the car flipped. Jordan had put something in the road. As Dexter crawled out of the wreckage, knives in hand, Jordan was waiting for him. The moment where Jordan discovered a missing knife and Dexter lunged at him, plunging the weapon through Chase’s foot and into the floor below so that he was rendered immobile, was totally thrilling. This show is so good! And, as is typical, it was followed up by an equally exhilarating emotional scene. Jordan was on the table, Lumen had got the knife, Dexter was watching. Chase was going to be dead soon, everybody knows it, but he wouldn’t shut up about the trio represented here, and he may be batshit, but he was onto something when he talked about the their bond and his role in it. “I wouldn’t have had it in me,” she said. In went the knife. And Dexter looked on with a mixture of pride and sexual exhilaration and, well, love. They were cleaning the tools when Deb showed up. Turns out that Lumen’s pounding in the back of the truck was so vigorous, a guy selling fruit at an intersection heard it, recognized Chase and called the cops. Deb responded. And now here she stood, her gun trained on the shadows of Lumen and Dexter, cleaning their knives behind a thick sheet of dirty plastic. Whoa. First of all, Jennifer Carpenter is amazing in these scenes. The conflict within Deb, something we’ve been building to for five seasons. The straight-arrow, true-blue, cop’s kid merging with this evolving, maturing woman who sees the gray area in life much more than she used to, that mix of conflicting personas is so artfully displayed here. And the takeaway was huge: Regardless of what happens with Lumen in the long run, she was no longer the only living person who really knows Dexter. Even though Deb wasn’t consciously aware that Dexter was No. 13’s partner in crime, she proved here that she understands that man, whoever he is, which means that Deb understands Dexter. And now he knows that. He’s no longer alone. The rest of the episode was lots of gooey making up and doing of good deeds. Dexter, who still insisted he hates Quinn, was so moved by his sister’s display of nuanced justice that he fudged the blood evidence left on Quinn’s shoe. Dexter was not willing to send his sister’s boyfriend to jail for a murder he himself committed. Deb, in the wake of her decidedly complicated showdown with the vigilantes, forgave Quinn’s own complexity. “I don’t know what you did or didn’t do and for some reason you’re not saying,” she said. “But I’m not judging, I can’t judge — not anymore.” Quinn smiled. “I’m glad you’re here,” he said. “I’ll be here no matter what happens,” she responded. And at Harrison’s birthday party, LaGuerta and Batista made up as well. He was moved by the empathy and wisdom she displayed toward Deb while he was under investigation, so they decide to turn a new page on the whole we’re-married-and-in-love thing.